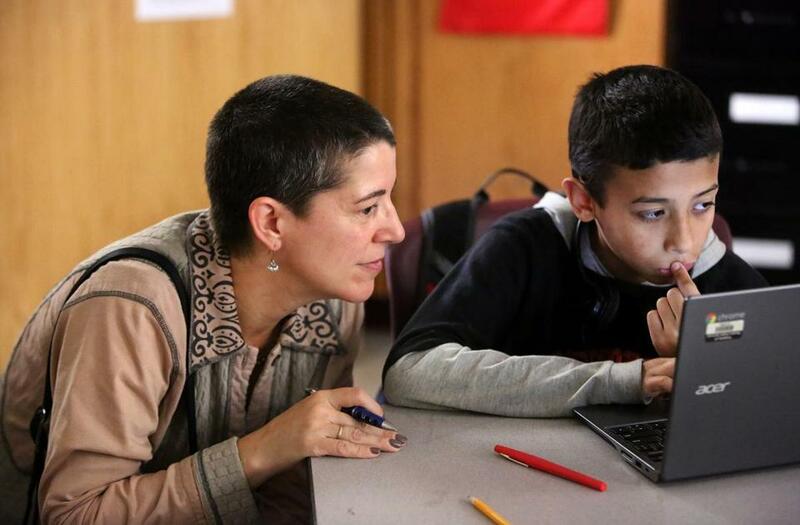 EdVestors president Laura Perille watched as TechBoston Academy sixth-grader David Iovanna worked on math. In a darkened classroom, sixth-graders leaned toward glowing laptop screens in a surprising state: absolute silence. Headphones in place, eyes staring ahead in absorption, they were not idly surfing the Web on a recent morning. Instead, the students at Dorchester’s TechBoston Academy were carefully considering math problems, typing their answers into boxes on the screen, and getting instant feedback on their responses. TechBoston is one of eight district schools and charter schools across the city participating in a pilot project launched this year by EdVestors, a nonprofit group that connects local schools with funders seeking to improve public education. Through the partnership, EdVestors provides access to interactive math programs for fourth- through eighth-grade classrooms, as well as support from a math specialist. The technology helps address deficits in students’ understanding of math but also provides more advanced work for those who are ready for it. Eighth-grader Kajiah Scott and other students used technology in math class. As she paused in translating a decimal number into a fraction, sixth-grader Chloe Raymond said she finds it easier to focus on math problems when she solves them online. “When you do it on paper, everybody is talking and you can’t really focus,” said Chloe, 11. Chloe gave the interface — which includes colorful cartoons and visualizations of the math problems — a 7½ out of 10 for its coolness factor. She said, though, that she doesn’t always like that each student is working on a different lesson at any given time — sometimes the other children’s work looks like more fun. But that ability to have each student working at an individualized level is a big selling point for Alia Verner, who teaches math and science at TechBoston and helped select the program. In Verner’s eighth-grade classroom, which includes students with special needs, the math skills range from those expected in seventh grade all the way to the kindergarten level. The program’s diagnostic tool allowed Verner to quickly assess the students’ abilities in a range of math skills, showing her which areas they have mastered and which require special attention. With that information, Verner can target online lessons on the skills individual students lack, she said, helping bring them closer to a level playing field. 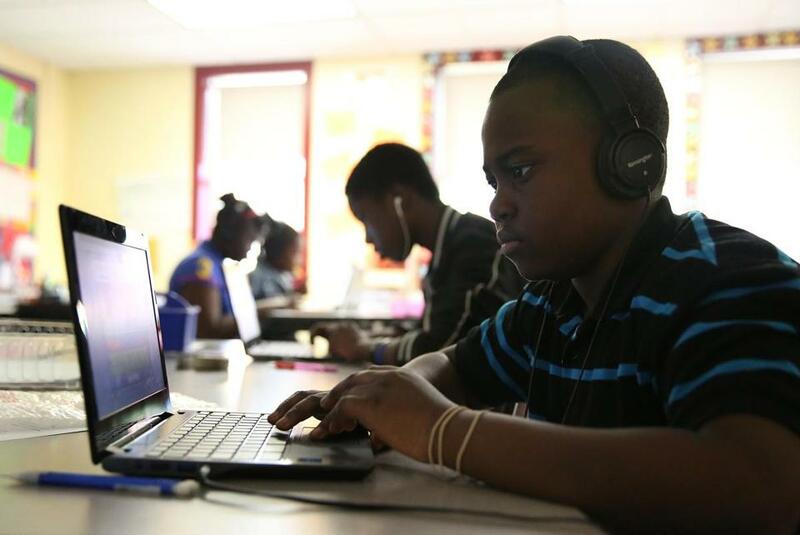 Nationwide, technology has become a common teaching tool, and other Boston schools have successfully experimented with using computer programs to improve math proficiency. But the pilot program in Boston, called Zeroing in on Math, is unusual in testing several computer programs as complements to existing math instruction, while gathering data to determine which approaches are most effective. 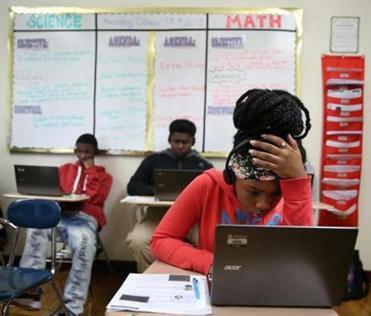 “If we change things over time, then eighth-graders are going to leave Boston schools heading up into high school prepared to do rigorous math — that’s the goal,” said Laura Perille, chief executive of EdVestors. Research has shown the importance of math proficiency in pursuing higher education and in career success. A study conducted in Boston schools found an apparent correlation between taking advanced math courses in high school and acceptance into elite colleges and universities. The program coincides with a new collaboration between the city and local philanthropic groups and corporations to expand access to science, technology, engineering, and math education, announced recently by Mayor Martin J. Walsh. 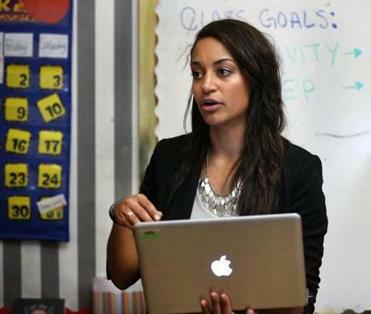 At TechBoston Academy, Alia Verner has taught math lessons utilizing programs from EdVestors. Tommy Chang, Boston’s schools superintendent, touted that effort as a way to prepare students for the modern job market, saying that 45 percent of job postings in Boston are in fields related to those subject areas. Other Boston schools are experimenting with a variety of materials and computer programs to supplement traditional math instruction, said Linda Ruiz Davenport, the School Department’s director of mathematics. “We definitely want to use what we learn . . . to be able to make broader recommendations across the district,” Davenport said. But, she added, the eventual goal is to strengthen math teaching across the district so that few students will need additional support. At Gardner Pilot Academy in Allston, sixth- through eighth-grade teachers are trying out another program that offers similar features but has a different look and feel. Meleah Neely,an eighth-grader at the Gardner, described the flexibility of the system as she eyed a problem that required dividing a fraction. Liz Byron, the Gardner’s math learning specialist for sixth through eighth grades, said the technology allows part of a class to work independently while a teacher provides instruction to another group of students. But that’s not the only benefit. Students at TechBoston Academy, such as sixth-grader Rivaldo Phane, used EdVestors technology to work on math.